Since the heating, ventilation and air conditioning system is open and circulates air all the time, it is likely to accumulate dust and pollen and possibly fungi and bacteria as well. Rely on us, at Air Duct Cleaning Milpitas, to remove these harmful particles and to leave the surfaces spotless. Our company has long-term experience in the industry and is known for delivering optimal results in little time. In addition to cleaning all HVAC system components that get dusty and dirty, we can fix them as well. This is how we ensure high indoor air quality at all times. * Powerful equipment - Dust and dirt are suctioned from the surfaces of the ducts with the use of great force. With our tools, we reach and thoroughly clean even the narrowest and farthest sections of the ductwork. * Potent materials - They do an excellent job in sanitizing the surfaces and preventing the growth of bacteria and fungi. They are completely safe, as well as effective. * Special care - Our technicians repair air ducts as well. If there is any damage to these system components, we fix them with precision to ensure their optimal functioning and to reduce the risk of contamination to the possible minimum. Our service is all-encompassing and includes the cleaning of air filters and condenser units. We replace filters with new ones when this is necessary. The service includes HVAC unit repair if required. All of these things are done to make the system work effectively and efficiently and to keep the indoor air quality high for longer. 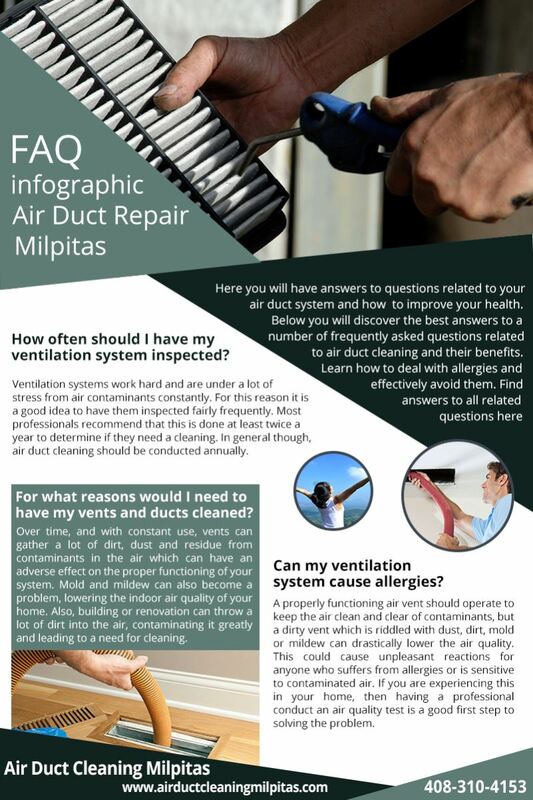 With Air Duct Cleaning Milpitas, you and the people that you care for will enjoy a safer home environment and lower risk of allergies and other respiratory conditions. Optimal energy efficiency is another one of the major benefits of our professional services. Leave the cleaning of dryer vents to us as well. Our technicians work skillfully to remove the lint buildup swiftly without leaving even a single scratch to the vent. This is how we ensure its optimal performance and the minimizing of the potential fire risk. When the vent requires fixing or replacement, rely on us to do this job as well. Our replacement components are strong, durable and reliable. For the professional cleaning of your HVAC system and dryer ducts, call us or leave us a message. Get more details about our services from our website.